Tungsten, silicon, and boron blast nozzles. Blast nozzle holders and gaskets. SILICON NITRIDE BLAST NOZZLE REQUIRES APPROX. 45 CFM AIR SUPPLY TO ACHIEVE 100 PSI. 3..
SILICON NITRIDE NOZZLE 6.4mm (1/4") REQUIRES APPROX. 80 CFM AIR SUPPLY TO ACHIEVE 100 PSI. 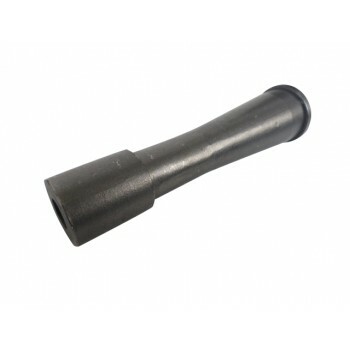 ..
SILICON NITRIDE SANDBLASTING NOZZLE 5/16" ( 8mm) REQUIRES APPROX. 140 CFM AIR..
SILICON NITRIDE BLAST NOZZLE 3/8" (9.5mm) REQUIRES APPROX. 190 CFM AIR SUPPLY T.. SHOT BLASTING NOZZLE 7/16" (11mm) REQUIRES APPROX. 250 CFM AIR SUPPLY TO ACHIEV..
1/2" (13mm) SILICON NITRIDE NOZZLE REQUIRES APPROX. 340 CFM AIR SUPPLY TO ACHIEVE 100 PSI. .. Blast hose nozzle holder NOZZLE HOLDER TO FIT 1.1/8" o.d. (27mm) BLAST HOSE. 25mm (3/..
NHP 3/4 NYLON NOZZLE HOLDER TO FIT 1.3/8" (34mm) o.d. BLAST HOSE. * LIGHTWEIGHT & D.. Blast hose nozzle holder NHP 1 nylon nozzle holder to fit 1.1/2" (38m) o.d. blast hose. ..
ANH 1 aluminium nozzle holder to fit 1.1/2" (38m) o.d. blast hose. * Lightweight .. BLAST HOSE NOZZLE HOLDER NYLON NOZZLE HOLDER TO FIT 1.7/8" (48mm) o.d. BLAST HO.. BLAST HOSE NOZZLE HOLDER NYLON NOZZLE HOLDER TO FIT 2.1/8" (54mm) o.d. BLAST HO..
NG-25 Gaskets for NHP-1 , NHP-2 , NHP-3/4, & LR-1 nozzle holders Precision rubber gaskets,..
NG-32 Gaskets for NHP-2 Nylon nozzle holder Precision rubber gaskets, designed to re.. REQUIRES APPROX. 140 CFM AIR SUPPLY TO ACHIEVE 100 PSI. THIS IS AN ENTRY LEVEL NOZZLE , DES.. REQUIRES APPROX. 200 CFM AIR SUPPLY TO ACHIEVE 100 PSI. THIS IS AN ENTRY LEVEL NOZZLE .. REQUIRES APPROX. 250 CFM AIR SUPPLY TO ACHIEVE 100 PSI. THIS IS AN ENTRY LEVEL NOZZLE ..
Light alloy nozzle retainer, for use with the boron alloy range of flanged nozzles. Standard 50mm .. Pack of 5 replacement nozzle flat rubber gaskets for the boron alloy range of blast nozzles, and ANH..
1/8" ( 3.2mm ) STRAIGHT BORE, TUNGSTEN CARBIDE BLAST CABINET, & SMALL BLAST POT NOZZLE. REQUI..